Hand Made Sterling Silver Peridot Bangle Bracelet Indonesia, "Orchid Twist in Green"
Komang Suastra is an artisan from Indonesia who has always been passionate about designing jewelry. 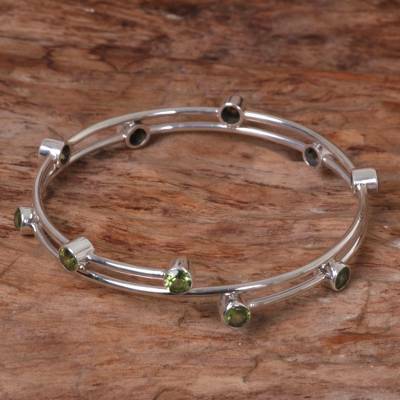 He handcrafts this contemporary bangle bracelet from sterling silver, adding five carats of peridot stones. Bracelet : 7.5" Inner Circ. You can find peridot bangle bracelet 'Orchid Twist in Green' by Komang Suastra in jewelry categories such as Modern Bracelets, Birthstone Bracelets, Peridot Bracelets, Silver Bracelets, Sterling Silver Bracelets and Bangle Bracelets. Enjoy exploring these sections for other Novica treasures. This is a first time purchase from the Novica site, I was not sure what to expect from this site and I am stunned by the quality of this beautiful bracelet, the peridot stones are very sizeable and a generous amount around the bangle. This is by far the best bracelet I have ever purchased. Thank-you Komang Suasrra for sharing your gift with all of us.